Here are a couple of videos from Delaware State Treasurer Chip Flowers from four years ago. Considering the current mess he finds himself in over the misuse of state issued credit cards, and his inability to get his story straight, these videos go far beyond ironic. The first one is titled “Revamping State Agencies”. The second one id titled, “Fiscal Responsibility”, now that is funny! “Deferred compensation”? “Making sure every dollar spent is spent efficiently”? “Innovative financial practices”? WOW! If only we had known what that meant four years ago. Deferred compensation means spend what you like with the state’s credit card and don’t pay until you get caught. Efficient spending must mean $7o.00 breakfasts on the states credit card. And innovative financial practices can only mean losing records of spending until cornered, and then finding them, but still refusing to disclose them. 4 Comments on "Chip Flowers, On The Record"
Inspector General anyone? 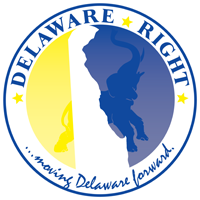 Delaware is so corrupt, Dems and the GOP, hand in hand in the cookie jar. Mr. Protack, you are falling prey to the same illogical assumption that the people who supported the idea of the sheriff’s office did. You assume that by creating a new elected office, that somehow that one office will never be corrupted, even though you have time and time again stated that the state and its elected officials are corrupt. Please explain why a new elected office would be exempt from this corruption? Maybe the first IG would be the most corrupted, maybe not. The problem we have is not that people are corrupted after being elected, it is that the voters will re-elect them after being corrupted. The last thing Delaware needs is another money wasting political office headed by a crony with a state credit card. ← Immigration! The Next Big Push?